Chudnow Double Check Valves are designed for the protection of the water supply from carbon dioxide gas and carbonated water. These substances can flow from post-mix beverage systems and are very acidic. If acidic water meets copper pipe, it causes the leaching of copper salts into the water supply and if ingested, can cause nausea, abdominal pain, vomiting. Double check valves prevent the reverse flow of water into the potable water supply due to back pressure or back flow and is used for continuous or intermittent pressure conditions. Recommended for use on Post-Mix Carbonated Beverage Equipment and dispensing equipment for tea and coffee. Chudnow Double Ball Check Valves are designed for the protection of the water supply from carbon dioxide gas and carbonated water. These substances can flow from post-mix beverage systems and are very acidic. If acidic water meets copper pipe, it causes the leaching of copper salts into the water supply and if ingested, can cause nausea, abdominal pain, vomiting. 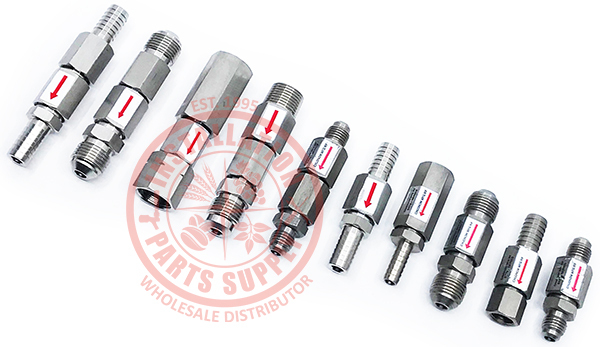 Double check valves prevent the reverse flow of water into the potable water supply due to back pressure or back flow and is used for continuous or intermittent pressure conditions.